There are a handful of books that I have read that I think are not just important and impactful but truly life changing. 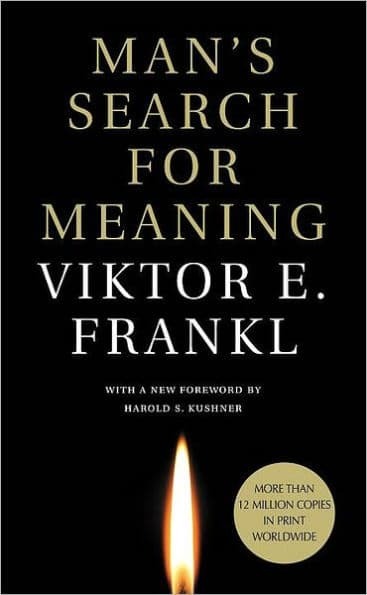 Man’s Search for Meaning by Viktor Frankl is perhaps the best example of such a book. If you haven’t yet read this book, Frankl writes about his experiences and survival of four different concentration camps, including Auschwitz. It is truly an uplifting book despite all of the misery and horror he illuminates. Frankl’s writing constantly comes back to me as I make decisions about my life. Frankl’s experiences led to his understanding that humans are meaning seeking beings; to be happy and in right relation with our world, humans need to have a meaningful purpose to their struggles and efforts. I believe the definition of a “work-life balance” is when you have meaning in your work and play that contributes to your life. Feeling lost, overwhelmed, and always tired, or not being able to do what you feel you want or need to do, saps the meaning from our work and life. When we can accomplish meaningful things, we are happier, more productive, and living our lives more fully. This is a phrase a Buddhist monk shared with me once. I think of that, too, when I feel overwhelmed and out of balance with work and life. It’s not that there won’t be struggles, but with the right approach and systems in place, there can be a lot less suffering. Frankl did not believe that having a meaningful life was without struggle. In fact, the struggle itself may be the real meaning you face. I have learned and internalized many strategies for work efficiencies that allow me to be more in the moment and focused on what truly matters — be that at work, or not at work. I can mentor and teach other people to learn some of these skills, too. This is how I believe I can add meaning to the “second half” of my adult life and why I have started Agile Time Coach. Work-life balance is not about working more or having more free time. It’s about having more meaning and purpose to your work and life. Man’s Search for Meaning by Viktor E. Frankl. Beacon Press. "So, about that "new" job of yours..."
This entry was posted in Work-Life Balance and tagged books. Bookmark the permalink.